Heating pads have been used to help relieve cramps, muscle aches, and tension--but you can also use one to warm up the bed while you turn down the thermostat at night! We researched and reviewed a number of the best-selling heating pad options to find the best ones. But before you get into our reviews, take a look at these specs to pay attention to when looking for a heating pad. Dry Heat: Dry heat is a common form of heat therapy, and can be used for a range of aches and ailments. Moist Heat: Moist heat is a more intensive, penetrating form of heat therapy that some people use occasionally or exclusively. Washable Cover: Don’t worry about eating or drinking during your heat therapy session when you use a washable heating pad! Dimensions: For laying on the mattress or covering large areas like your back, a bigger heating pad is obviously better! Weight: If you want to take it traveling, you may want a lightweight heating pad, but most pads aren’t very heavy. Warranty: Most heating pads come with five-year warranties that are great to have in case you encounter any issues. Now that you’re warmed up, let’s get into the reviews! In a rush for your heat therapy fix? Then look over our top pick and budget pick first. If you want to thoroughly compare your options, read the eight additional products that just had to make our list! Let’s heat things up a little! The PureRelief XL is a king-sized 12x24’’ heating pad with a thick microplush fiber cover. And that cover is washable! 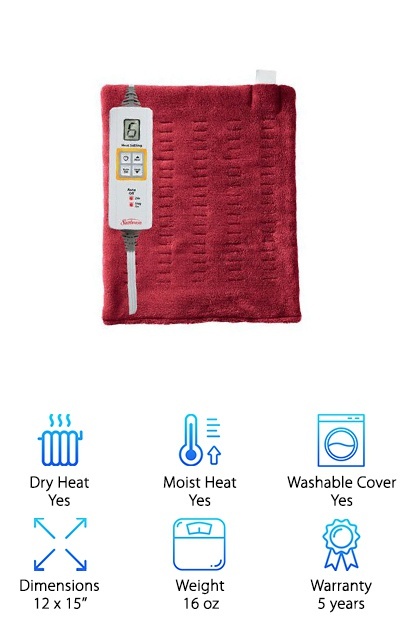 Use the LCD controller to choose from six temperature settings and lay back and relax--the heating pad will shut off automatically after two hours. This makes it a good bed warmer if you hate crawling into cold sheets! It heats up quickly (in just a few seconds) and you can spritz it with water to use it for moist heat therapy as needed. The nine-foot cord gives you flexibility in where you plug in the heating pad. This large heating pad is a great option for providing heat to large areas of the body like your back. It also comes with a storage bag to shield it from wear and tear between uses. Leave behind the itchy flannel covers and slippery vinyl pads for the true luxury of our top pick for the best heating pad! Although fancier heating pads are on the market now with softer-than-ever pads, the tried-and-true vinyl pad is a great budget option if you’re looking for the best heating pad that won’t break the bank! The Sunbeam Ultra heating pad measures 12x15’’ and has a soft-touch polyester cover that’s machine-washable over the vinyl pad. 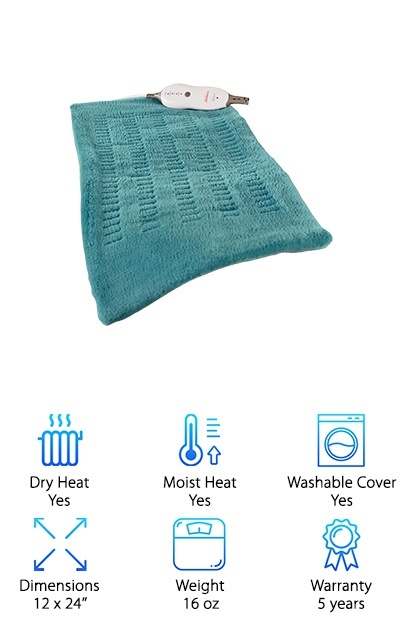 An absorbent sponge insert is included for moist heat therapy, and you can use the slide controller to choose from three heat settings. 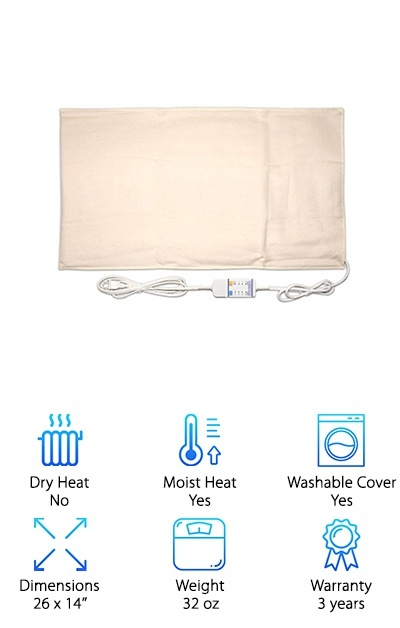 This simple heating pad doesn’t automatically turn off like many others on the market, so it can be a good option for taking to bed and leaving on overnight on the “low” setting. It’s a good size to put under cold feet as well as for therapeutic uses! If you prefer a heating pad with a timer or want a larger option, check out some of the other products on our list for a range of options! This heating pad from Sunbeam comes in green or burgundy in a luxe 12x24’’ size! The soft microplush cover is comfortable on any part of the body, and the whole pad can be machine washed between uses. The digital LCD controller allows you to choose from six temperature settings and set the pad to stay-on mode or automatically shut off after two hours. 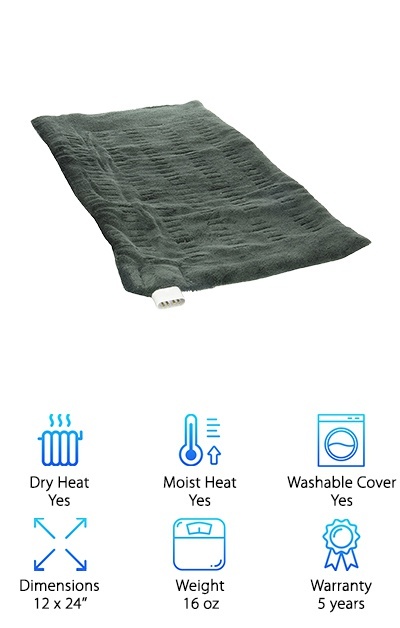 It can be hard to find a continuous-on heating pad these days, so we had to include this one in our product reviews! The cover can be spritzed with water for deep moist heat therapy, too. If you’re looking for a heated mattress pad that can keep you warm all night, the Sunbeam XpressHeat may be the one for you. One of our favorite features of this Sunbeam heating pad is that it heats quickly in just 30 seconds so you can get warm right away! 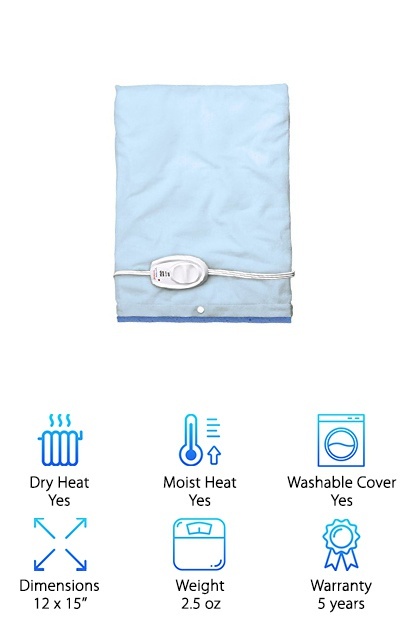 Available in grey or blue, the PureRelief heating pad is designed specifically for the neck and shoulder area with a contoured draping shape and magnetic clasping closure. The super-soft “Micromink” cover is removable and machine washable in case you spill something on it. The magnetic clasp keeps the draping pad in place even if you’re moving around during your heat therapy session. You can spritz the cover with water for the moist heat experience, too! The controller lets you choose from four heat settings. The pad will keep heating for two hours before automatically shutting off, so it’s a great option for taking to bed with you for warm relaxation while you fall asleep! It heats quickly on top of all that, plus it as a nine-foot cord that can easily stretch from your bed or chair to the outlet. 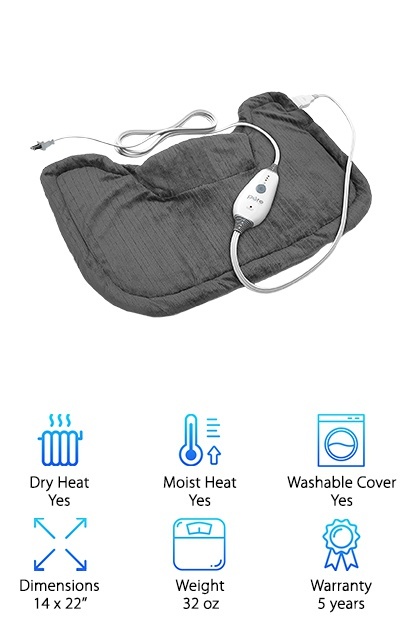 If you want a heating pad that’s comfortable to wear around your shoulders and neck, this one is close to perfect! 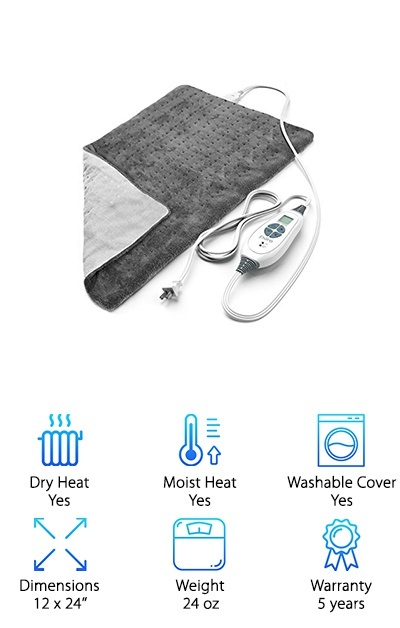 The BodyMed Electric Heating Pad is a moist heat therapy heating pad that doesn’t require you to add the water yourself: it uses the humidity of the air to create moist heat! The soft fleece cover is removable and washable, and more comfortable than traditional flannel covers. This pad is a large 14x27’’, but you can also find it in 12x15’’ and 14x14’’ sizes. The digital LCD controller lets you set the temperature and timer from one minute to 60 minutes. Once you have the settings you want, you can “lock” the controller so the settings won’t change if you accidentally press one of the buttons. The lock-out option is nice to have for putting a heating pad in bed or dealing with curious kids interfering with your heat therapy naptime! We liked the variety of time and temperature options, even though the timer “only” goes up to an hour. If you don’t select a time, it shuts off automatically after 15 minutes. The CARA 73 Heating Pad is a king-sized 12x24’’ that can be used for dry or moist heat thanks to the included cloth sponge insert. The remote control lets you set the temperature from 120-170 degrees and a timer from 30-60 minutes with automatic shutoff. The controller has an LCD display to help you easily set the time and temperature you want. You’ll start to feel the heat in just 30 seconds! It’s also available in a smaller 12x14.5’’ pad, but isn’t bigger better? If you’re concerned about safety, rest easy: besides the automatic shut off, the pad has SmartWire technology, overheat protection, power short prevention, and wire break and short detection. The removable cover is washable in case of spills or stains. For penetrating wet heat therapy, just wet the cloth sponge insert and squeeze it out before inserting it into the cover. It’s easy and awesome! The Sunbeam Microplush heating pad features a super-soft cover that’s even machine washable for total convenience! The cover has a soft velour-feel fabric on one side and Microplush fleece-feel fabric on the other side. The velour side provides optimal heat transfer, while the Microplush side is comfortable and even softer. The remote lets you set the pad to four heat setting options, and will automatically shut off after two hours. If you want a heating pad that runs for a long time but still shuts off automatically, this is the pad for you! For long, luxurious heating pad sessions or falling asleep cozy warm, you can’t beat a long timer. We love how soft the cover is on top of being machine-washable, and you can spritz it with water for moist heat therapy. 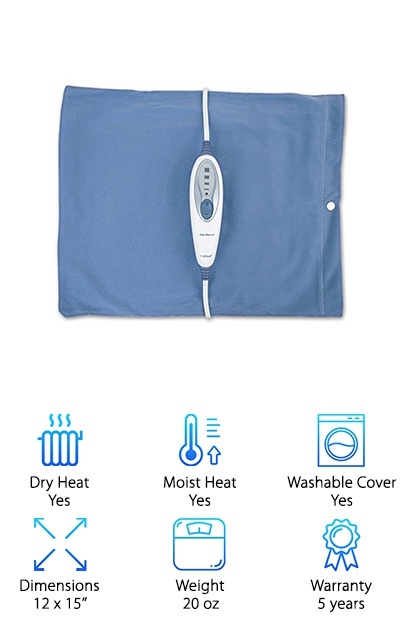 This heating pad is a great size for heat therapy on just about any part of the body, too! 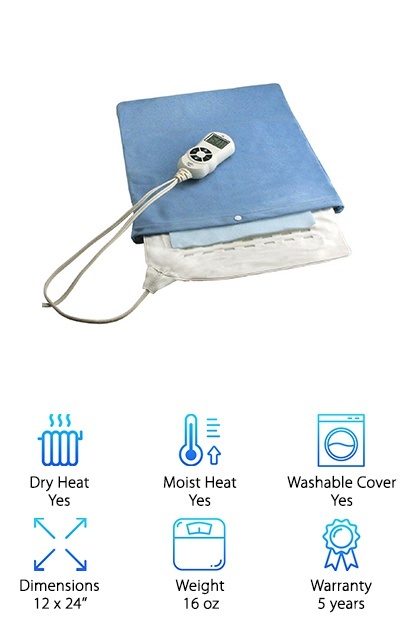 The Thermotech Automatic Heating Pad is a moist heating pad that draws moisture out of the air to act as deep and effective moist heat therapy on sore or cramping muscles. This king-size pad measures 26x14’’, but you can also find it in 19x7’’, 18x14’’, and 18x18’’. With the controller, you can set the automatic shut off timer from 15-60 minutes and the heat to four levels, up to 166 degrees. The flannel outer cover is hand washable for accidental spills and stains. 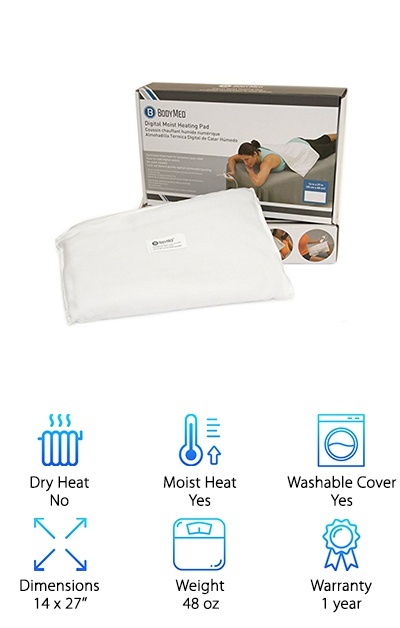 If you’re looking for a large heating pad that you can set up in your bed to warm it up, or an extra-large pad for extra-large heat therapy needs, this pad is a great option! Flannel can be a little itchy compared to microfiber materials, but it’s part of how the pad creates moist heat. The timer options work well for short to long heat sessions to handle just about any heating pad need you have! The SoftHeat Plus Heating Pad has a soft fleece outer cover that is removable and machine-washable. Spill your glass of wine while tending to your cramps? No problem! This pad is also available in a 12x24’’ “king size” option. You can use the controller to set the pad to four different heat settings, and it automatically shuts off after 60 minutes. That means you can fall asleep using it without a care in the world! The cord is nine feet long, giving you plenty of maneuverability. The five-year warranty provides peace of mind as well. You can use this pad for dry heat, or spritz the cover with water for moist heat therapy. This large pad can fit comfortably on your lap or across your bag to handle a variety of aches and pains! It has simple features and controls with an easy-to-use design. The Sunbeam Xpressheat heating pad is a lightweight heating pad with a great five-year warranty. It heats up in just 30 seconds and can be used with dry or moist heat--just spritz water on the cover for deep, penetrating moist heat. A digital controller lets you select from six heat settings and set a timer for the pad to turn off automatically after two hours. The cover is made from microplush on one side and SoftTouch velour-feel polyester on the other side, and you can remove it for washing if it gets dirty. Whether you need some extra heat on cold days or like to use heat therapy for aches and cramps, the Sunbeam Xpressheat is a fast-acting way to take care of both issues! The two hour off setting is great for warming up your bed as you fall asleep. This soft and flexible heating pad is an inexpensive product with a great value.